Story time at KiDeens is interwoven into the syllabus and appears at various stages in the lessons planned. They also propagate moral values and life skills in small children. Listening to stories encourages children to use their imagination and immerse themselves completely in another world, whether it’s funny, exciting, or a little bit scary! This ability to create a “movie” in their mind will help them with comprehension as they learn to read – and will help them come up with ideas when they begin writing. Stories are a rich way to strengthen your child’s language skills and vocabulary, whether it’s in a first or second language. Storytelling enforces reading skills by helping children become familiar with different parts of a story, such as characters, sequence, and the plot. This is further enhanced by our talented teachers who are master puppeteers. We at Kideens believe that puppets are an edge between entertainment and education. They can both teach and persuade. They come to life as characters as soon as their creator starts moving them. Kideenites witness many puppet shows in a year. The puppets used for the shows are handmade and painted by the team of teachers. Many puppets are Marionettes made out of light wooden boards. They have arms that the storyteller can move. 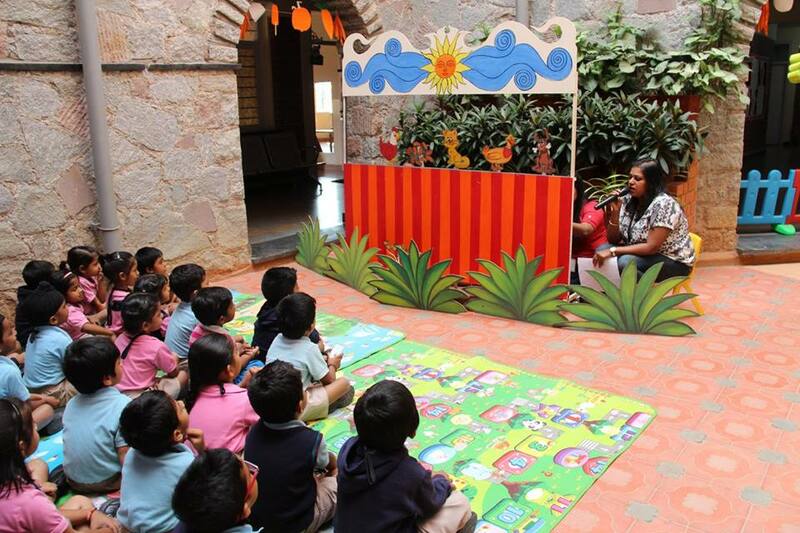 All puppet shows are done in our very own puppet theatre. A team of talented teachers tell the story with a melodious voice. The stories are carefully selected so that they are matched to the developmental needs of the children.